I get asked this by friends and family and the answer depends on what they want it for and how manual/automatic they want it. But I was asked this by someone in the industry. 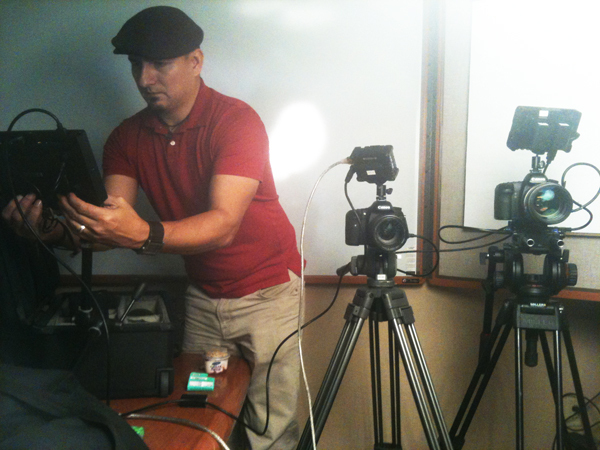 They are ready to upgrade to new technology and liked the setup I have for corporate video production. First, more often than not, I use a DSLR for my corporate work. But occasionally I need something to record long form– like a seminar or meeting. So what follows is what I recommend for corporate film– like interviews and sales videos, or marketing videos. If you’re recording a board meeting, the DSLR is not the best choice. Camera– I have the DSLR Canon 7D. My DP Ron Gonzalez has a 5D (both shown in the picture on the right). A Partner of mine has another 7D. These cameras are great for the corporate film. The 5D has a full size sensor offering maybe too much depth of field. The 7D has a robust sensor, but slightly smaller than the 5D. The Canon 60D has the same sensor of the 7D and it comes with a flipout viewfinder (a little more friendly for video). But the 7D has two processors to the 60D’s one. More important for great looking images (thus high production value), is the glass. Make sure you get a fast lens or two (this decision is more important the the 60D or 7D or 5D question). Fast means that the f stop is a low number. Like 1 or 2 or 2.8. Anything higher than 2.8 I would just stay away from for video. If it’s a zoom lens and has two f stop numbers (like 4-5.6), this means that as you zoom in, you need more light. This would be a consumer lens. Avoid it for professional use. I also like the IS technology (image stabilization). Different lens manufacturers call it different things, but I have been amazed at how steady my 250mm handheld is zoomed in. Yes, for panning shots, you might want to turn it off. As for the lenses I like to keep around… A super wide comes in handy for corporate. I have a 11-16mm. I also have a great 17-55mm. I have a not so great 70-250mm, so this will be the next lens purchase. For a monitor, which is very important, I use the SmallHD DP6 (reviewed here). This is the next most important purchase after the camera and lens. It is extremely difficult to get a good focus on these shallow depth of field cameras, especially outside in daylight, so you will need a good monitor. Get a good fluid head tripod. I have a small Matthews that I love. Other accessories include extra batteries, chargers, HDMI cable for monitor, hot shoe mounts. And finally a good bag to put it all in and you’re up and running. One word about sound… you will need a Zoom or a Tascam DR100-like recorder. Sound is a problem recording straight into the DSLR’s. So think old school film-style where the audio is separate and synced in post. Which by the way– for $20 you can buy a slate app for the iPad that adds oodles of coolness on the set for the clients. Down the road, you can think about a shoulder rig– but whereas I thought that was going to be important, it has moved way down the priority list for corporate film and video. Other tools for your rig include jibs, sliders, and other neat toys.